Spanish fitness was the key as they beat the Springboks this evening in a very physical match where the advantage repeatedly switched sides. Report and photos from FER/Walter Degirolmo. Spain end 2018 unbeaten after their toughest game of the year against South Africa. 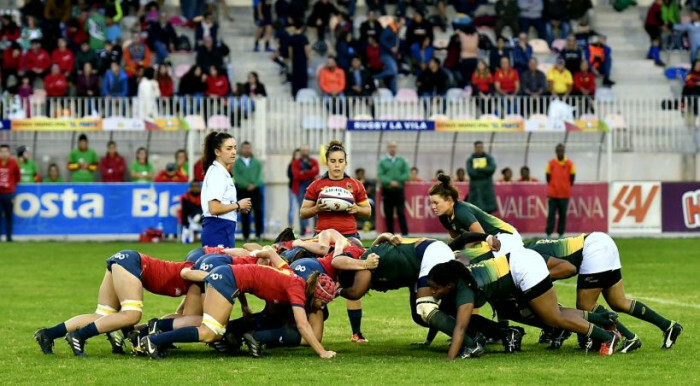 The match at Villajoyosa started Spain on top, with the opening six minutes all taking place at the Springbok end, finising with Spain’s first try. It came from the hands of an unstoppable Alba Vinuesa, who also scored against Hong Kong and is one the young players who have recently broken into the team. For several more minutes, Spain continued to attack, until a series of errors allowed the advantage to move to the Boks and, after several raids within Spanish 22, full back Vuyolwethu Maqholo was on hand to score the visitor’s try, though the kick was missed allowing Spain to retain the lead. Spain extended the lead just before the break with a try from Maika Brust. 14-5 was the halftime score. South Africa started the second half stronger than the first, physically getting the better of Spain up front and finding gaps in the defensive line, but Spain survived, thanks in part to the changes made to the front row, and managed to get the ball back and as the opposition tired. As the tired they made more errors, and Patricia Garcia was able to convert one of the resulting penalties in the 60th minute, putting the 17-5 on the scoreboard, which would ultimately be the final result.